Joseph certainly didn’t lack imagination. Observing the sky, he concluded that after all he could very easily make a cloud himself: so he got some paper from the factory, made an envelope, filled it with steam – and saw his idea collapse in a mass of sodden paper. Etienne wasn’t about to be left out: it was probably his scientific reading that gave him the idea of making a bag float in the air with gas obtained from sulfuric acid and iron filings. Another failure. But then in November 1782, working indoors, Joseph managed to get a taffeta envelope filled with hot air to rise to the ceiling. He summoned his brother: “Get in a stock of taffeta and rope and you’ll see one of the most astonishing sights in the whole world!” It was time for serious scientific experiments to begin. To the amazement of a group of spectators, the Montgolfier brothers soon managed to send a sort of giant paper bag some thirty meters (100 ft) up in the air, using gas obtained by burning a mixture of wet straw and chopped wool. Joseph and Etienne decided to push things further, via a “machine” for taking people into the air – an “aerostat” they called it. “Seraphina”, to use their private name for this strange contrivance, was to be a 12-meter (40 ft) envelope made of wrapping fabric lined with paper, with its multiple sections held together by some 2000 buttons. A totally hare-brained idea, according to their critics. After the preliminary tryouts, the first public experiment was scheduled for Annonay on 4 June 1783, just happening to coincide with a meeting of the area’s most influential people. The town square in Annonay was packed, with people struggling to get a look at the balloon spread out on the ground and tied to wooden posts. The fire was lit and the envelope began to fill; some of the spectators became uneasy, not least because of the horrible smell given off by the burning mixture of straw and wool. Under a menacing sky and with the wind beginning to rise, it took several men to hold the enormous balloon down until the order was given to let go. Seraphina took off and a few minutes later was no more than a dot in the sky, some 2000 meters (6500 ft) up. The “aerostat” began to drift and gradually descend, since the hot air was escaping little by little. Rushing after it the local people found it in the middle of a vineyard two kilometers (a mile and a quarter) from where it had taken off. News of the experiment traveled fast. Soon all Paris was talking balloons and the Montgolfiers even had a competitor in the capital. On August 26 the physicist Jacques Charles sent up a hydrogen balloon from the Champ de Mars: it came to earth in a village 16 kilometers (10 miles) away, where terrified locals attacked this monster from the skies. However the first “accompanied” flight – with a sheep, a rooster and a duck on board – was organized by the Montgolfiers on September 19, from the gardens of the Palace of Versailles. 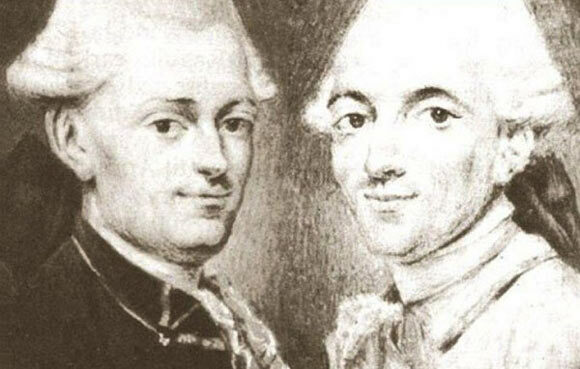 And finally, on November 21, Pilâtre de Rozier and the Marquis d’Arlandes climbed into a Montgolfier balloon for the first manned flight. Even Benjamin Franklin was lost for words. 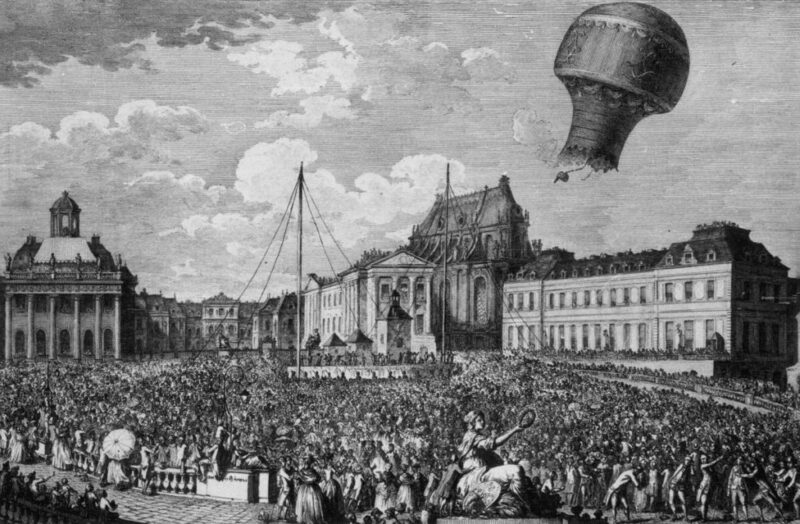 The hot-air balloon had been born and on January 19, 1784 the people of Lyon had their chance to admire the invention that began the conquest of space. 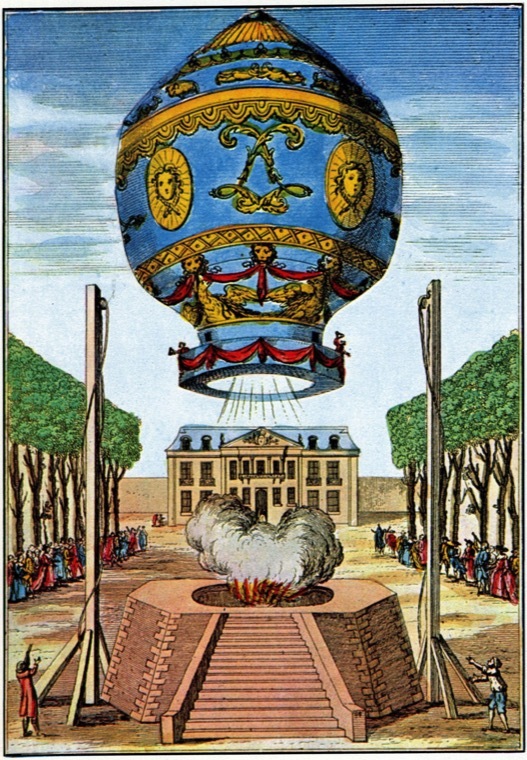 Charles’ balloon was a much more practical device than the hot air balloon in the 18th century, and differed very little from the gas balloons flying today. For almost two centuries hot-air balloons were virtually ignored until the late 1950’s when a balloon was built as part of a United States Government research program. This balloon was of man-made fibers and was filled with air heated by a propane flame. The modern hot-air balloon was born.